Full, robust sound in a comfortable 12-string. 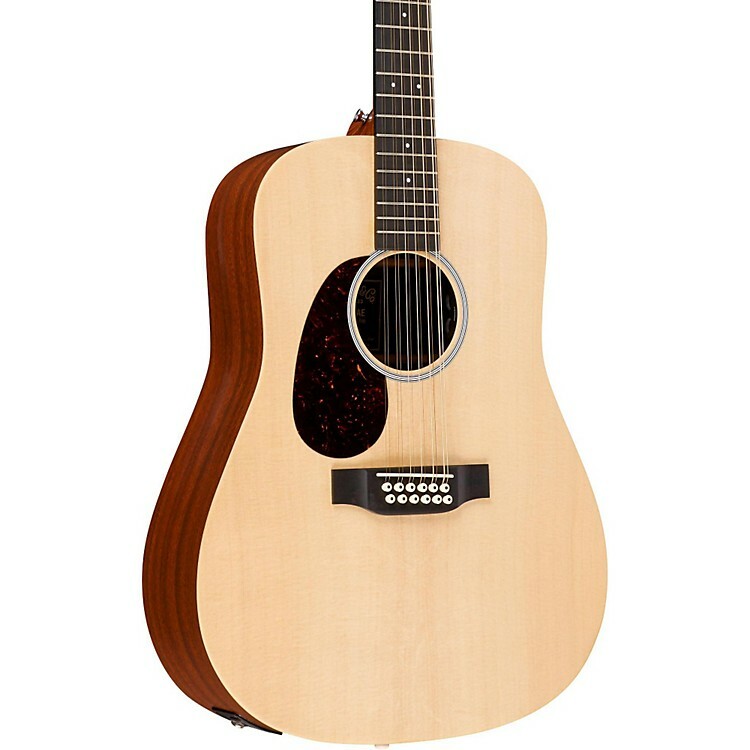 The 12-string Martin X Series D12X1AE-L Dreadnought Left-Handed 12-String Acoustic-Electric Guitar features Martin’s famous D-14 platform, dreadnought body design. The dreadnought was crafted to produce a powerful, rich sound that is perfect for the singer songwriter, as well as the professional touring and studio musician. Pairing the Sitka spruce top with the mahogany-pattern HPL back and sides, the X Series D12X1AE-L Dreadnought Left-Handed 12-String guitar has a powerful, rich tone, with all the sustain you have come to expect from a Martin guitar. The mortise-and-tenon neck joint ensures solid construction of the guitar, with optimal resonant tone, while eliminating drop-off in the finer dynamics. The guitar's laminate birch neck is a multilayered wood creation, bonding layers of wood under extremely high pressure. The material is then carved and finished in a conventional manner. The end result is a very strong neck that provides definition and articulate sustain from note to note. Dressed in a satin finish and featuring chrome tuners, chrome hardware, this guitar has the look and sound of a highly collectible Martin guitar, but goes for a price that anyone can afford. Embrace the dream of owning your very own Martin guitar, at a price that is too good to pass up. The Martin X Series D12X1AE-L Dreadnought Left-Handed 12-String guitar arrives stage ready-just plug them in and play. X Series Guitars feature patented high pressure laminate (HPL) back and sides with a<br>solid Sitka spruce top, patented mortise and tenon neck construction, and professionally installed Fishman electronics. The result: great-sounding, great-playing guitar, that is environmentally friendly, and priced to fly out the door. This is one of Martin's best values ever. The X Series affirms Martin's commitment to providing an affordable and competitive option for players dedicated to live performance and studio recording. All X Series guitars also include a Limited Lifetime Warranty. If you love the environment and great Martin tone, this is your lefty 12-string. Order today!